Welcome to another Cross Canada Blog Hop! 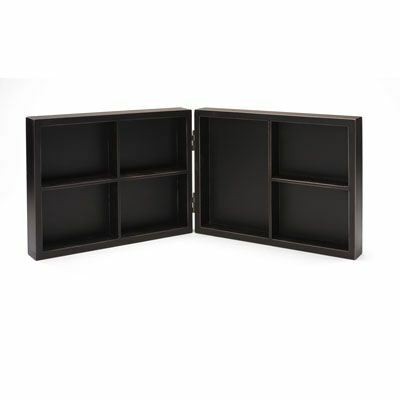 This month we are focusing on the Hinged Display Tray. This Display Tray is a 5×7 fold out wooden tray with divided sections. You can get a closer look at it on page 125 of the 2013 Spring/Summer Idea Book. It sells for $18.95. Talk to your CTMH consultant to order your’s, but if you don’t have a consultant you can click on over to my website to get your hands on one. If you came from Michelle’s blog, you’re on the right track. This is a circular hop, so just keep hopping through until you get back here, or, you can hop across Canada and start at Michelle’s blog. Here is what I did with this display tray. To be honest, I was a little intimidated by this product. I wasn’t sure what to do with it. It was so nice looking, I wasn’t sure I could use it properly, but when the choice was made to use this tray for the hop, I took it as a challenge and jumped in with both feet. These photos were taken over a year ago, but I still love creating with them. They’ve made it on to some layouts already, but those will be hidden in albums, so I decided to use them for permanent display. I had a very different plan when I started, but as I started working, I made small changes (and some big ones) to my plan. I even ended up flipping the whole thing around, but I love how it turned out! Here are close ups of each side. There is no stamping in this project. I only used ink on the edges of papers and on the wooden embellishments. 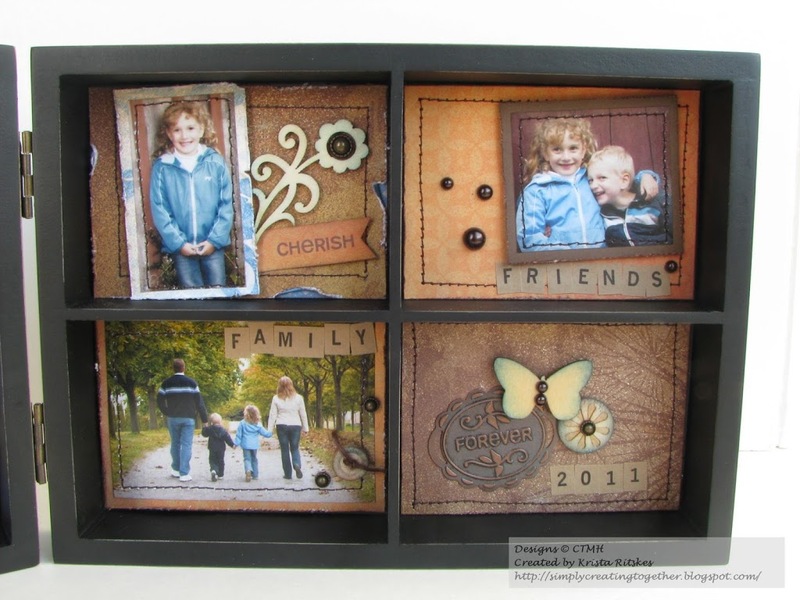 Now it’s time to hop on over to Michelle M’s blog. If you get lost along the way, you can go back to Michelle’s blog for a complete list. Enjoy! Join us next month for a focus on Home Decor. 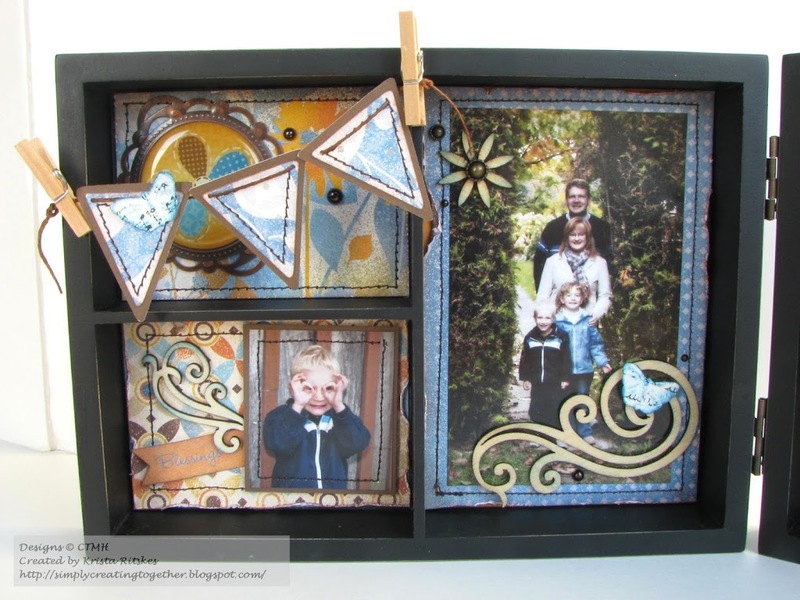 Krista, I love the banner,and the faux stitching on the photos….it looks great. Beautiful Krista! I can’t wait to see it up close and personal! Love it!!!! I cant wait to make one. Love your banner and the pictures are timeless ! Love all the wood accents. Great tray! I like how you used the banner on it! absolutely stunning. Love how you stitched around the photos & the embellishments you added. I am going to tackle another one and I hope it turns out as nice as yours. Wonderful job! Love the pictures. Love the clothes pins! Love the stitching! Wonderful! What a fun project with the banner and all the stitching! Thanks so much for sharing! Such a beautiful creation! Lovin’ this paper, especially with your photos! Awesome!